Specifications: This gun shoots about 310FPS stock. It also has a metal slide and barrel. It has a length of 10 inches from the far back to the front of the barrel. It weighs around 5 pounds. 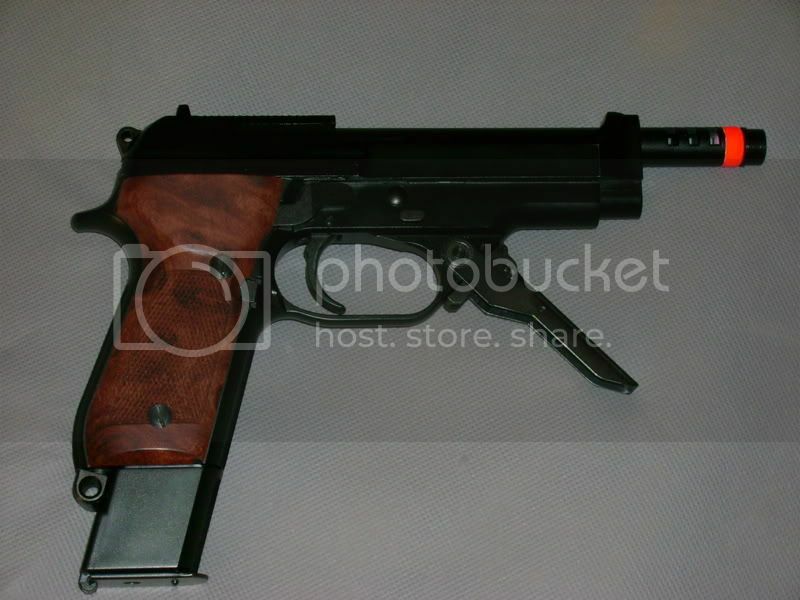 It has Semi Auto (Top position), Full Auto (Center position), And 3 round burst (Bottom). The safety is located right behind the selector switch. Accessories needed to run: This gun is supposed to use green gas but I currently run it off of propane. I’m thinking of switching back though. 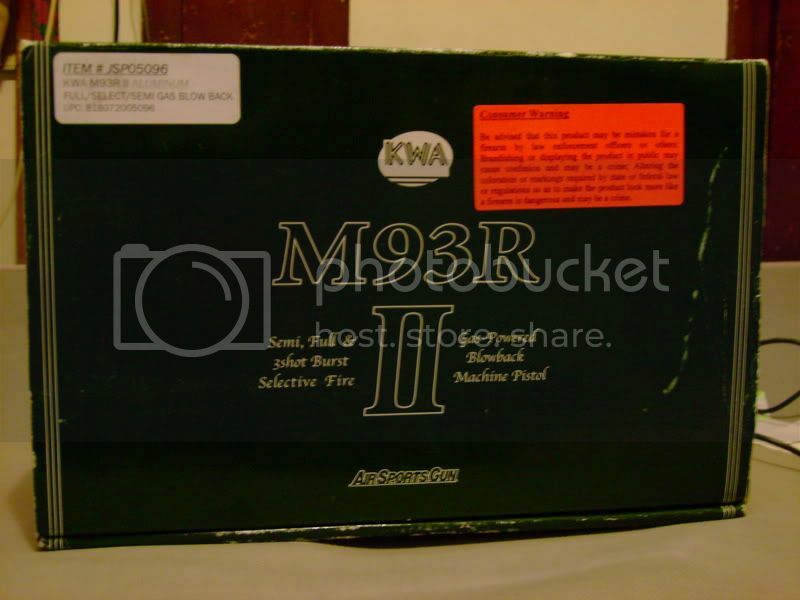 Cost and place of purchase: I bought my M93R II off of eBay from Uncle Che Airsoft. This person is a great seller and I highly recommend them. I was lucky in a bid and won it for $125 shipped. 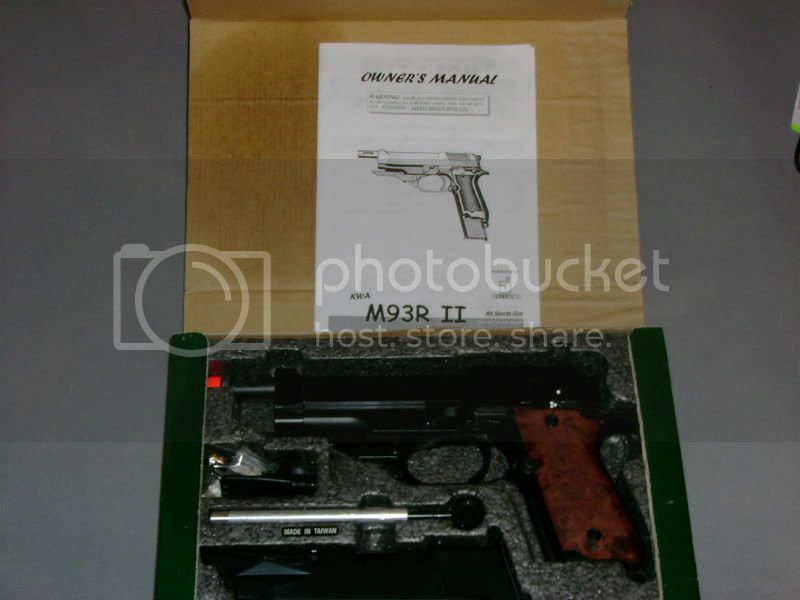 Intro/First Impressions: I first thought that the M93R was really ugly before I bought it. 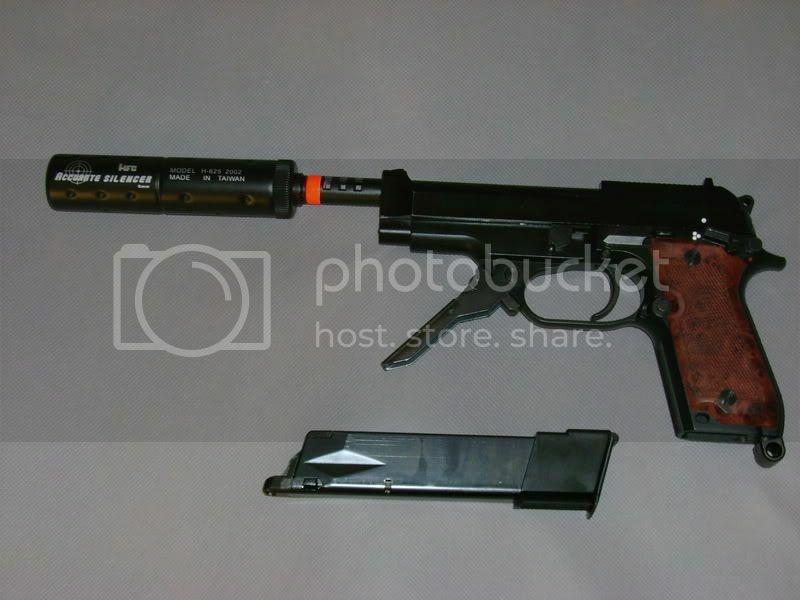 Then one day, I saw an ad from Jungletoy for a STTI M93R, spare mag, and BBs for $110. I set my goal for that gun and began to search ebay for it. I saw a Omega M93R for $80 shipped or I can bid on a KWA. I remembered something about KWA Being a lot better so I decided to bid on it. After five days which felt like an eternity, the package finally arrived. It was brand new in the box and the size of the box actually surprised me. It was small for what looked like a big handgun. I didn't hesitate to open the box and there it was. It was really beautiful; in fact, I almost shed a single tear. It was beautiful; I pumped in the gas, loaded the BBs, went to my kitchen, and shot at a box. It amazed me and anyone else who fired it. I decided from that point on that I would never ever trade/sell my M93RII. Looks: As I mentioned before, it looked ugly before I bought it but as soon as I held it and looked at it, the looks got better and now I think that the M93RII is the most beautiful gun out there. 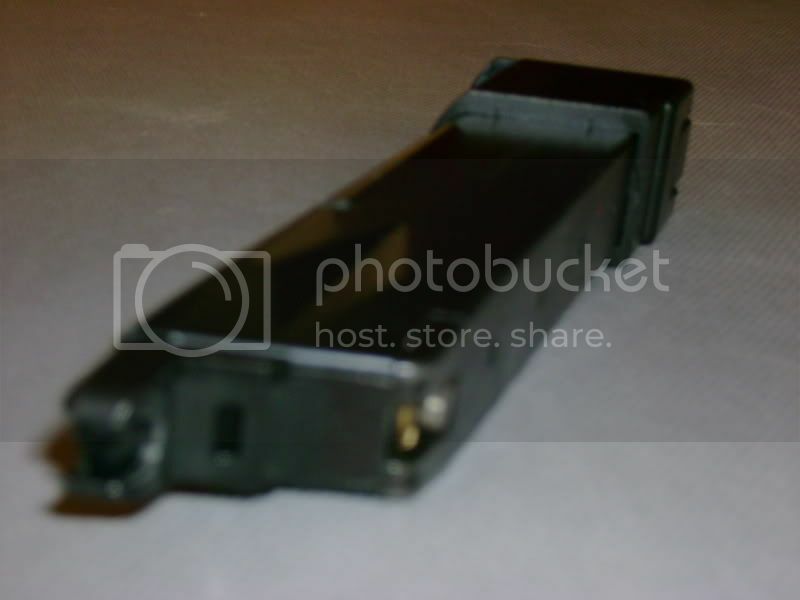 Metal Parts: Metal parts include the internals, barrel, slide, mag, trigger, foregrip, disassembly pin, slide catch, selector switch, and the trigger bar. Features: There is only one safety mechanism on this gun and it's not all that great. It is small and hidden behind the selector switch. 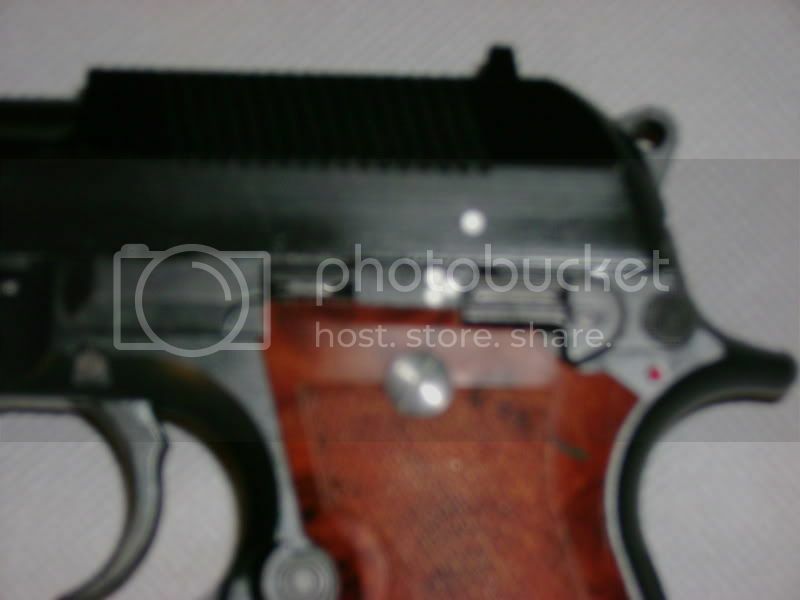 It is on the right of the selector switch in the picture. It only switches on when the gun is loaded which makes sense but I would like the safety to be able to operate regardless. I did attach a HFC Silencer on it. I did this because after a long time of researching and only finding that M93R silencers cost around $40, I decided to buy a silencer from an airsoft store in a flea market. Magazine, easy to load? : Yes, the magazine is very easy to load. KWA Supplies a loading rod/tube. All you do is attach it to the top of your mag, pour in the BBs, and ram them into the M93R's double stack mag. People say that you can hold 38 BBs in the mag but I can tell you that it will only hold about 30-35 BBs. The mag doesn't have one of those tabs that KWA Glocks have; instead, it is all closed off. I think that this is really nice. Firing, rate of fire: I really don't know the exact number on full auto but I'm guessing around 18-20 rounds per second. It may be less depending on what gas you use, I use Propane. Accuracy: The accuracy on semi auto is good just like any M92 but on full auto and 3 round burst, I'm not really that accurate. Perhaps I'm not controlling the gun correctly though. Any Upgrades you have installed: I have installed no upgrades, it will most likely stay stock because there is no use in messing with the gun's durability when it fires flawlessly in stock form with decent FPS. Conclusion: I would recommend buying one of these KWA M93Rs. I have seen very little used M93Rs for slae compared to any other guns and I take it that almost anyone who owns one loves it. I may wind up buying a spare mag for it sometime in the future when I'm not broke. I haven't had a single problem with my M93R yet and I've owned it for maybe a year or two now and everyone that I allow to fire my M93R has loved it. That's it, I hoped you all enjoy my review. Please PM me if you have any questions or suggesstions. 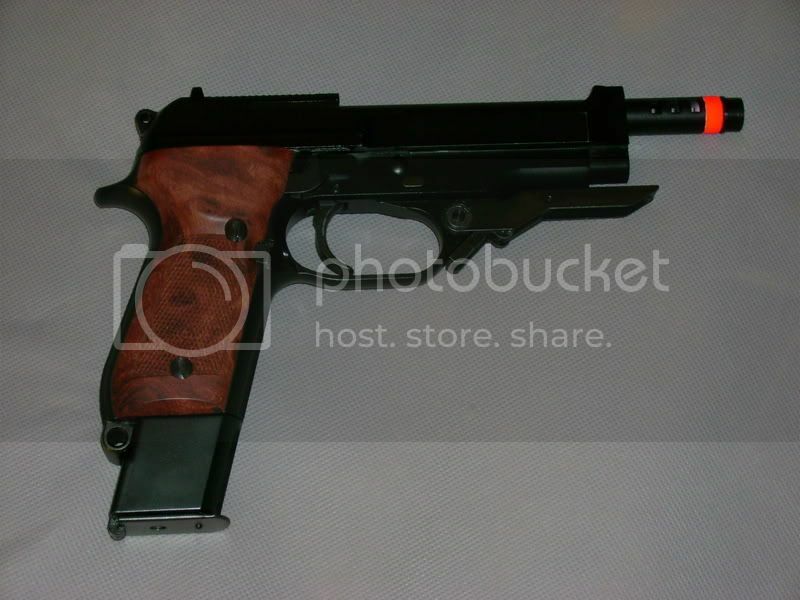 I have one, and it's a blast to shoot and it is beautiful. Great review, and does your camera have a macro function? Heh, I wrote this review quite a while ago, when I did not knowhow to use my camera. I simply copy+pasted the review over for AO.